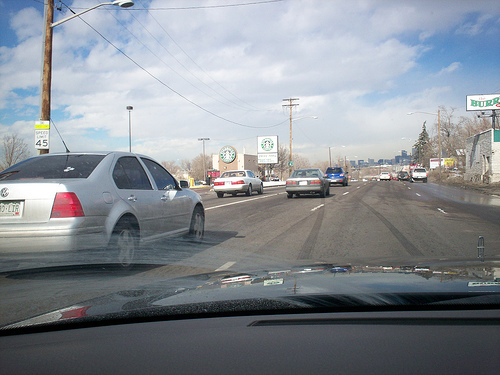 Within a matter of seconds, a loss of attention can lead to a car accident. Sadly, accidents from distracted driving are often more than mere fender-benders. Distracted driving has led to more than 5,400 highway deaths and 448,000 accidents this past year, according to theNational Highway Transportation Safety Administration (NHTSA). To keep your mind on the road and your car out of an accident, follow these seven easy safe driving tips that have been recommended by car safety experts. Talking or texting behind the wheel is perhaps the most important driving habit to break. Of all highway deaths last year, 18 percent involved drivers using a cell phone before the crash, according to NHTSA. Driving while using a handheld or hands-free cell phone makes you as impaired as a drunk driver, according to a University of Utah study. When talking on a cell phone, your risk of accident quadruples, and texting makes you eight times as likely to crash. Because even hands-free devices cause distraction, get into a driving habit of putting phones in a purse or briefcase out of reach in the backseat. 2. Listen to—don’t watch—GPS devices. These high-tech gadgets are supposed to help you navigate unknown streets, but if you fiddle with the controls or pay more attention to the screen than the road, you jeopardize your car safety. Program your destination before you start driving. And rely on the verbal cues from the GPS instead of the screen. If you know your nature is to keep looking at the screen, dim it. Before you leave for an unfamiliar destination, review maps and directions. One tool you might find useful is Google Map’s Street View. These 3-D views give you visual clues (turn right at that bright red gas station) so you don’t have to take your eyes off the road to look for street signs and house addresses. Don’t fiddle with gadgets like the radio, iPod, or climate controls while driving. Set up your playlist before you turn on the ignition. And set climate controls to a comfortable level before you put the car in drive. This advice is particularly important if you’re driving a rental car. Take a couple seconds to familiarize yourself with the controls. If it takes more than a glance to adjust a control, wait until you’re stopped to fix it. When you talk with others in the car, heated arguments may pull your attention away from the traffic signals and pedestrians. Make it a driving habit that you’ll save the big, deep discussions of finance, child-rearing philosophies, and politics for outside the car. The same can be said for handling misbehaving children. If a child acts up in the backseat, the safest thing to do is pull off the road and give everyone a chance to cool down. Unpredictable, unsecured pets can cause major distracted driving concerns. There are a variety of restraints suitable for your type of pet and car, from a cage in the back of a station wagon to a harness that can be buckled with the seat belt. The backseat is also the best place for pets. That way you won’t be tempted to pet or feed them. Daydreaming in a car can end up as a nightmare. If your mind is wandering to a problem at work or home, pull over to jot it down or make a phone call. Don’t let it keep running through your head. Also, take regular breaks—one at least every two hours (or about every 100 miles) on longer road trips.